This image taken of Megan was made after sunset. Heading back from our many outdoor locations, we came upon this great industrial scene on West 12th street in Erie. 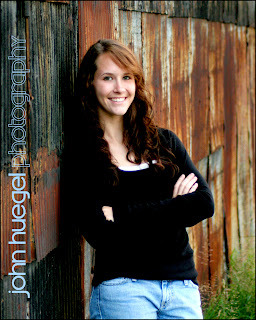 Megan’s hair color and top were very compatible with the tones in the rusted metal of this building. This was taken at a high ISO – around 1200 I believe, to allow for a 1/125 hand-held exposure. A bit of contrast and color saturation boost in post-process made this image sing!